Rare always managed to excite my imagination, starting with their entries in the Donkey Kong Franchise on the Super Nintendo Entertainment System. Goldeneye, Perfect Dark, and the Highly Underrated(amongst people who haven’t played it, that is) Conker’s Bad Fur Day on the Nintendo 64. When Microsoft acquired Rare from Nintendo in the early 2000s, I was pretty disheartened. I had expected the monolithic Microsoft to utterly destroy the Rare I knew. I am sure many of you have experienced the same palpable dread from time to time when it comes to this hobby. With Bethesda’s acquisition of id Software, those fears were proven immature with the eventual release of Doom(2016). Easily one of the best shooters I’ve played in the last decade. After a faltering start on both the Original Xbox and the Xbox 360, those misgivings were finally assuaged with Sea of Thieves. Sea of Thieves is a return to form for the legendary Rare. the world is brimming with soul, passion, and character. Often criticised for its’ lack of content, the much-maligned Sea of Thieves quickly endeared itself to me. I wasn’t a “day one” player like much of the initial player base, but I did get into the game shortly after it was released(about a week), and was quite enamored with the world that Rare managed to craft. 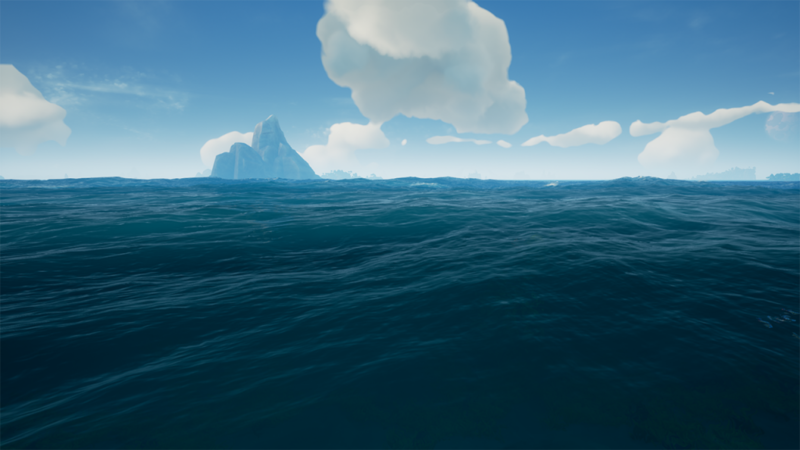 Sea of Thieves offers a rather large oceanic sandbox with a plethora of well designed and unique islands to explore by yourself or with a cadre of like-minded scoundrels of the sea. The game opens up inside a fairly nondescript tavern with a bevy of pirates for you to choose as your avatar, you can lock specific models and generate more if you so choose. After choosing your pirate, you’re greeted with a screen giving you the option of playing on a Galleon(3-4 Player Vessel) or a Sloop(1-2 Player Vessel). The names of the various islands and outposts have a pirate-y feel to them(Keel Haul Fort, Shark Fin Camp, Skull Keep, Tri-Rock Isle). The dearth of Ocean to explore is both a blessing and a curse, with a tailwind you can cross the map in short order. With a headwind, you’re in for a slow trek across what seems to be an endless sea pocked with little bits of adventure. The RNG factor of the Wind led my crew and me to name our vessel “The Br(e)aking Wind” because you’re never too old for fart jokes. The weakest part of the game is definitely the PVE(Player vs Environment) aspect of the game, as you’re limited to four different kinds of radiant quests given to you from one of three factions. The Gold Hoarders, The Merchant Alliance, and finally The Order of Souls. Next is the Merchant Alliance Quests, which are in essence timed fetch quests. Go collect 300 chickens and go to this island before a fixed amount of time has passed. I found these quests to be pretty mundane if we’re being honest. Finally, we have the Order of Souls quests, which give you a single quest or a series of quests to find and eliminate a crew of skeletons and claim the skull of the Captain. The faction quests are akin to the quests that you are given in Skyrim, in that they generally target islands in fairly close proximity to each other, and if you pray to RNGesus, your vessel. Where the game truly shines is the PVP(Player Versus Player) aspect, assuming you can find a crew of individuals with the few things required for success in Sea of Thieves: A working mic, ears, and a couple thumbs. Sarcasm aside, with a properly crewed and run Galleon, you can rule the seas with nary a vessel to challenge your prowess. I have had the most fun trying to hit the other vessels with a Gunpowder Barrel, or simply firing myself over in a Cannon and attempting to wreak as much havoc as I can while my shipmates send a barrage of lead. The cacophony of cannons playing a boisterous dirge for the soon to be doomed ship. 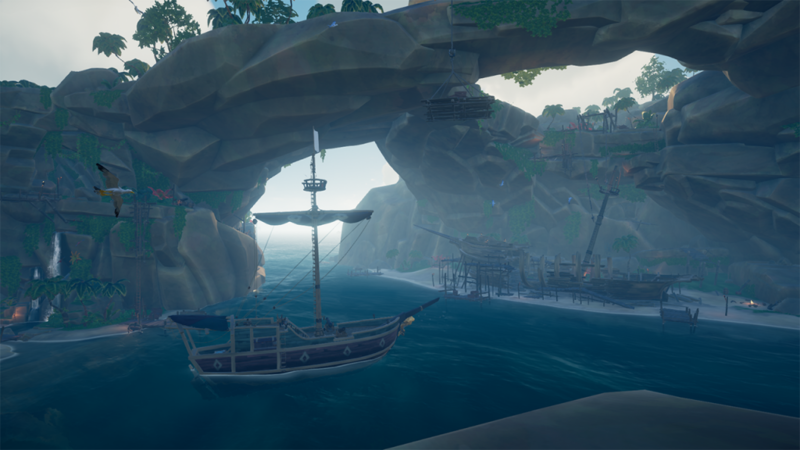 Something my crew and I try to do is start off our play with a Skull fort, after which we try not to visit an outpost until someone has to log off, we find that having a belly full of loot makes the PVP that much more exciting. You play a bit harder when you have something to lose. On each side of the ship, there are controls to raise, lower, and rotate the sails. Which controls operate which sail are pretty obvious even to a neophyte. The main key to traversing the seas is catching the wind as much as possible, otherwise, you are in for a long voyage. Graphically, Sea of Thieves has the best looking and most realistic water effects I’ve ever seen in a video game. The character models are cartoony and have that stylised Rare feel to them, as do much of the Islands, vessels, and buildings themselves. Assuming you’re on a PC, even on the lowest graphical settings, you’ll have a gorgeous well-designed game to play. If you’re looking for a sandbox pirate game with enough content to keep you going for at least a week or two at a casual pace, and you enjoy PVP interactions, you’ll love Sea of Thieves. If a set goal with a clear road of advancement is more your speed, I’d give Sea of Thieves a pass. Regardless, I’ll be continuing my journey. See you on the Seas, Y’arr. 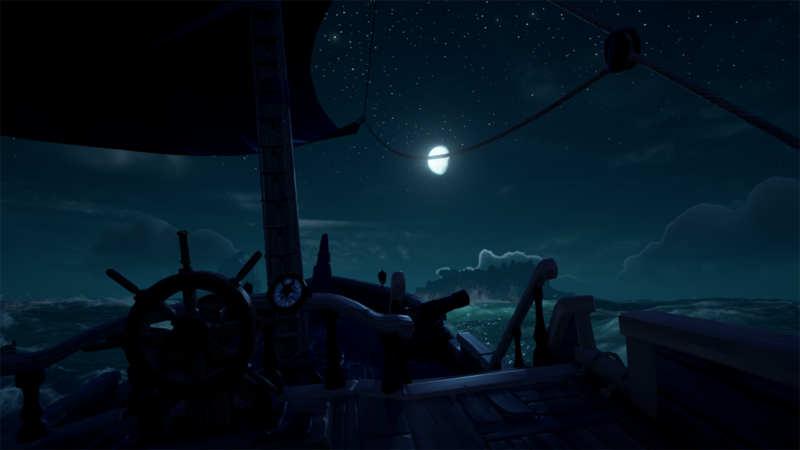 This article was based upon the PC/Microsoft Store version of Sea of Thieves, and may not be applicable to the Xbox One Version in any way shape or form. Review by: William Griston, games way more than he should, but still not enough. Want to get involved with Gigamax Games and start contributing your own content? Find out, how! Good well rounded review. Nice use of vocabulary too. So happy to hear you enjoyed it! This was our contributors’ first review of many. Be sure to stick around for more of their content. Williams contributor page should be available shortly!